» How to make Office 2016 or 2019 or 365 your default Microsoft Office application? How to make Office 2016 or 2019 or 365 your default Microsoft Office application? Applicable to the following Office versions: 2019,2016,2013, 365; Windows 7, Windows 10. Thanks for the question. In this post we will learn how to set your new Office version (being it 2016 / 365 or 2019) as default for the Microsoft Office files types mentioned above. Open the Control Panel in your system and click Programs and Features. Search and check on Microsoft Office 2016. Click on it and hit Change present at the top. Check on Quick repair to fix the issues and select Repair. Mostly repairing will fix you with the issues, but if still the issue is not cleared try the manual process. Right click on any .xlsx file in your computer, then go ahead and select Open with and select Choose another app. 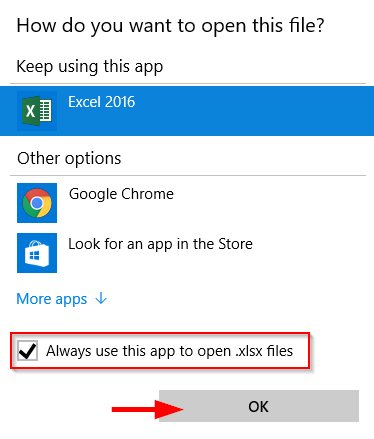 Click on Excel 2016 and check on Always use this app to open .xlsx files. Now you can see that all .xlsx files default program is set to Excel 2016. Note: Using a similar procedure, will allow you to make Excel the default program for csv, Google Sheets, Open Office. Right click on the .docx file, move over open with and select Choose another app. Click on Word 2016 and check on Always use this app to open .docx files. Now you can see that all .docx files default program is set to Word 2016. Right click on the .pptx file, move over open with and select Choose another app. Click on PowerPoint 2016 and check on Always use this app to open .pptx files. Hit the Search Windows magnifying glass icon (located at the left hand side of your task bar). Then for each known/relevant file type, select the default opening app. There might be cases, mainly around compatibility with older file formats, in which you might want to leaver the older Office versions (2010 and older) as default. There might be cases in which Word, Powerpoint or Excel 2016, will not be listed in the default program list. If that’s the case immediately after you have installed the new version, you might want to restart your computer and re-check. If there is still an issue, you might need to re-run the installation program. Compatibility issues might arise when trying to open Microsoft Office files in Open Office, Libre and Google Docs. Still got an unanswered question? See our guide on how to get answers to your Microsoft Office questions. Thank you!! The repair worked. I have been frustrated by the issue of Windows 10 not offering the option of selecting a desktop application for setting the default program when you are trying to do this through Default app settings > Set defaults by app > Excel 2016 > Manage. Using this standard approach, only the “Look for an app in the Store” is shown (i.e. it is not possible to choose a desktop app) – I am using the desktop apps of Office 365. This was so easy to do in earlier versions of Windows (through Control Panel). The fix described here is simple and it works (luckily, Microsoft has not been successful with clobbering Windows/File Explorer, as it was with switching everything away from the powerful Control Panel to the dumb Settings app). Thank you for taking the time to post this!